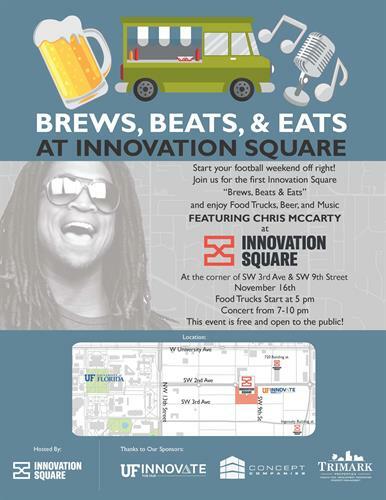 Join us for the first Brews, Beats & Eats at Innovation Square featuring Chris McCarty and enjoy food trucks, beer, beverages and GREAT music! 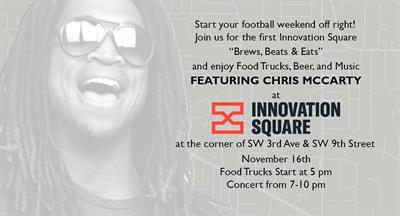 We'll be at the corner of SW 3rd Ave & SW 9th Street! Don't forget those lawn chairs and blankets! This event is FREE and open to the public! 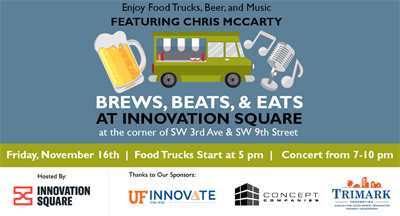 Big THANKS to our sponsors, UF Innovate The Hub, Concept Companies, and Trimark Properties! Come on out and start your football weekend off right! We hope to see you there! 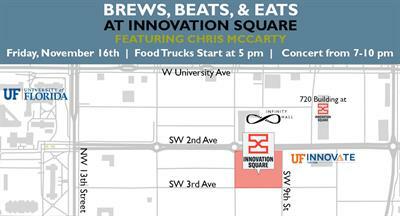 Innovation Square at the corner of SW 3rd Ave & SW 9th Street!